Tennessee Bull Terrier Rescue View other Bull Terriers for adoption. 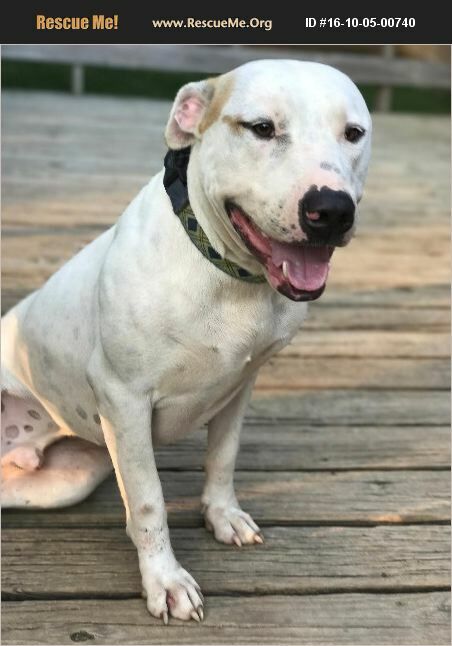 We'd like you to meet Rocko, Tennessee's next hunky eligible bachelor! Rocko is about 2 years old and wieghts 56 lbs. This Bull Terrier mix could be the next big thing to hit Hollywood, or hey, maybe the next Target dog!! He's good with female dogs, as well as submissive males. Rocko is good with kids, and he absolutely loves all people. He's also good with cats and acts uninterested in them. Rocko wanted us to mention that he really needs a fenced yard or an active walker/runner for exercise because, as we all know, maintaining a 'Hollywood figure' isn't easy and he loves to keep active. Rocko is crate trained. Rocko still may chew a thing or two if not supervised, so he goes in his crate when his foster mom isn't around. We saw instantly how smart he is because he easily learned how to go in his crate on command, he knows sit and down, as well as other fundamental commands. While people are around, he will lay down and just relax. He just loves people and being around them. Rocko's adoption fee is $85.00. He is neutered and up to date on vaccines and microchipped. **PLEASE SUBMIT AN APPLICATION AT www.RuralAnimalRescueEffort.org **An application and home visit are required prior to adoption. All of our pets are or will be spayed/neutered, up to date on all vaccines and micro-chipped prior to adoption. Please complete the application on our website and we will call you to answer any questions you may have. Our ability to perform out of state adoptions is limited and reviewed on a case by case basis. If you are not in TN, please ask us about the potential of adopting the specific animal you are interested in. Our adoption fees not only help the animal being adopted, but they also help to cover heart-worm treatments and other treatable ailments that many animals, that would otherwise be euthanized, need to be made available for adoption. Thank you for choosing to adopt, foster, or aid in the rescue efforts of RARE! Please visit www.RuralAnimalRescueEffort.org for foster and adoption applications or for additional information. ***Please Note*** The breeds noted are guesses on the part of the volunteers of RARE based on the physical characteristics of the particular animal. We are not breed experts and cannot afford to perform DNA tests; therefore, the noted breeds may not be exact.